The Gnoo Blas Motor Racing Circuit was a temporary race track located in the rural city of Orange in NSW and ran car and bike races from 1953 to 1961. It was the birth place of the Australian Touring Car Championship (1960) which has now evolved into the Australian V8Supercar Championship. It was also the place where Sir Jack Brabham began his road racing career. Orange is only 40 minutes down the road from Bathurst and it was this proximity that arguably led to to it's eventual closure. The public roads that it was run on still exist today with very little change. Anyone can go there and drive around the original circuit layout. 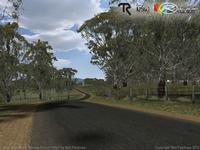 This is a virtual historic recreation of the Gnoo Blas Motor Racing Circuit as it was in 1953. The project was organised by Rod Monk of Troyton Racing Simulators and has been funded by Tourism NSW as a promotion for the town of Orange. Thanks go to Denis Gregory of the Gnoo Blas Classic Car Club (gnooblas.com) for providing much of research material as well as personal accounts of his own racing at the venue. There are currently no setups for Gnoo Blas 1953. Add a Setup. Sorry to hear you are having problems. Try running rFactor in windowed mode (tick the Windowed box in the config). It's possible the game is trying to show you a pop up error message which could indicate a corrupted download. If so let me know what it says. If not we'll have to try something else. The track does use a number of high resolution textures, so fairly recent hardware is recommended. Can't wait to try the track out. I downloaded and installed with the 'one click' option, however when I try to load the track it loads to about 50% and then the screen goes black. After a few more seconds the mouse cursor starts flashing on the black screen and I can hear the AI cars driving past. Tried all three dx settings I the config with the same result. Hi Nigel75. I'm sorry you are having a problem installing the track. There are no reports so far of anyone else having that issue. There may be a way to stop Norton from removing threats without confirmation, or perhaps the installer can be restored from its 'Vault' or 'Quarantine' somehow? I don't use Norton so I can't help you very much I'm afraid. Hey there, my Norton is not very happy about your installer.. After the download it is analyzed and sadly removed.. every damn time. Any suggestion? Why do you need to package this as an installer? I would like to put the track in my main rfactor directory. But, I don't want a shortcut nor do I want to trust an installer to do the job. Is the any chance or source to download the track without the installer? Ab-sah-lutely fantastic track! Thanks for this great great track! Simply Stunning.... Amazing work Neil, Thankyou ! !